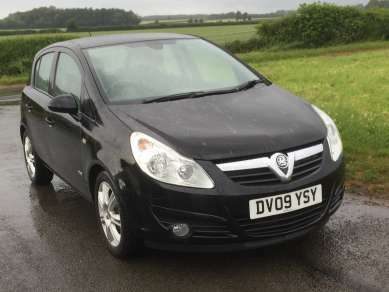 MAY 2009 VAUXHALL CORSA 1.4 DESIGN 5 DOOR, BLACK, 66,350 MILES, REMOTE CENTRAL LOCKING, A/C, ELECTRIC FRONT WINDOWS, E/M, STEERING WHEEL CONTROLS, FRONT FOGS, ALLOYS with 195/55R16 TYRES. MOT MAY 2019. SERVICE HISTORY.